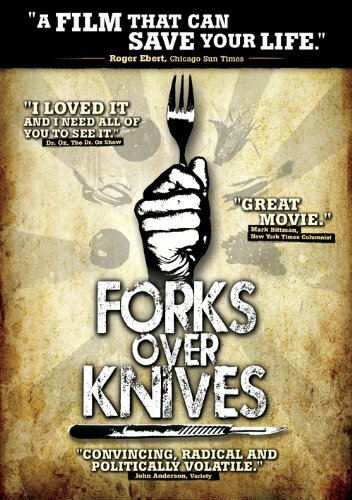 After reading about Forks Over Knives on History in High Heels, I really wanted to watch it. Fast forward to Saturday night - Sunday Morning when I could not sleep, I put it on and I am astounded by how much I enjoyed the documentary. The documentary advocates for a whole food plant based diet in the American people. It is so good for the body that studies have proven that diet can cure people of diseases they have had for years. It presents both research in people and rats as well as testimonials and actually case studies of people becoming better with a plant based diet. The awesome concept in this documentary is that Dr. Campbell and Dr. Esselstyn have proven that a plant based diet can eliminate cancer in people forever. They say that even though we have cancer in our genes, plant-based products turn off growing cancer tumors and reverse them while animal-based products help them to grow. With a study done in China over many years - one of the most comprehensive done in the world dissecting the link between diet and diseases, they proved this concept! The controversial concept in the movie is that milk and animal products are advocated in the American diet because of big business and money. Many of the people on the board to make the dietary standards in America are aligned with big businesses like eggs, milk, yogurt and meat. They would want to make these things prevalent in the American diet to make money and keep business booming. It would also eliminate healthcare costs for chronic diseases and medicine production. There were three main things that really helped me to understand how good this is for the body. One man and one woman both had a lot of what I call "American" diseases - diabetes, hypertension, high cholesterol and a slew of other health issues. With the new diet, they both lost at least 30 pounds and felt so much better. So much better that they did not even need the medications they started out with in the beginning of the movie. The other case study that I loved was the Dr, Esselstyn's son who was a triathlete turned firefighter in Texas. He eats a whole foods based diet and challenged his other firefighters to get their cholesterol checked. One of them had a cholesterol level in the lower 300s which is really high - near death. They all started eating a more plant based diet and his cholesterol went down significantly. The other great side effect of the diet was that they enjoyed eating the plant based foods and it made them feel better as a team, which is important when fighting fires everyday. Lastly, there was a segment about how the receptors in your stomach work. Basically, there are two kinds of receptors: Density and Fullness. 500 calories of nutrient dense plants fill the stomach activating the brain to stop eating, while 500 calories of calorie dense foods half way fill the stomach so you eat a little more and 500 calories of oil barely make a dent in the stomach's volume making you eat a ton of it to be full. I always sort of knew this to be the case but to see it laid out like that was awesome! Plants fill me up - you have to eat a lot of them but it's very low in calories for a full stomach vs. a burrito at Chipotle that will fill me but it's two or three times the calories of the veggies. Diet is a huge part of how you feel! I totally agree with that concept after my experiences in my freshman and sophomore year of college. When I came to college, I was a full vegetarian. I did not eat fish but I did eat eggs and cheese regularly. Because the dining halls really catered to meat eaters, unless I went to the buffet which was more expensive, I would end up eating a weird mix of processed foods and fresh veggies when I could find them. It was really hard for me to eat the way because I was accustomed to eating pretty healthily at home. I felt pretty sluggish. I slept a lot - took a nap or drank a large cup of coffee everyday to keep going at the pace that I work at now. After I moved off campus and could cook for myself, I had the problem of going to the grocery store and literally wanting to buy fresh food but also lots of junk. It's really hard to resist (Pleasure Trap) because it tastes delicious and it's cheap! Finally, half way through my junior year, I started buying food at Trader Joe's or Aldi religiously and it made all the difference. Though I have gained weight since my freshman year, I feel pretty good most days without drinking 3 cups of coffee or eating a lot of junk food. I treat myself to good fair trade dark chocolate or fruit ice pops and some sort of salty snack each week but I try to keep processed food out of my diet when possible. It's amazing the link between food, diet and health. There is a bit of sketchy science in the documentary but the overall message is a good one. Eating a more plant based diet with less processed foods will improve your health. Completely cutting out milk and cheese and meat may not be possible for most but limiting your intake to one meal a day or a couple times a week is a good start towards good health. My dad always says "The better gas you put in your car, the better it will run." I believe this to be true about the body. If you put in good things, it will be good to you in the long run. P.S. For those who love to play Devil's Advocate - check out this review. Super long but dissects the movie with great graphs and indepth readings of the studies.